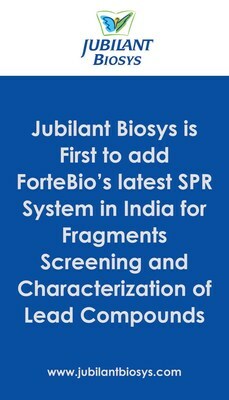 BENGALURU, India and SAN JOSE, California, March 28, 2019 /PRNewswire/ -- Jubilant Biosys, a subsidiary of Jubilant Life Sciences Ltd, announced today that it has added advanced Pioneer FE system to its platform of drug discovery solutions available to customers. The Pioneer FE system from ForteBio, the Biologics Business Unit of Molecular Devices, represents the next generation SPR instrumentation for label-free characterization of biomolecules. The Pioneer system uses a unique OneStep® gradient injection technology to facilitate fragment screening and is also sensitive enough to measure high affinity and covalent binding events. Pioneer systems with OneStep® technology can analyze up to 768 fragments in 24 hours, obtaining kinetics during the primary screen and eliminating the need for additional screens. Greg Milosevich, President of Molecular Devices, commented, "We are pleased to have Jubilant adopt the Pioneer platform and look forward to supporting them and their customers' goals in fast-tracking small molecule drug discovery programs."